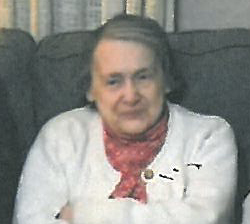 Betty Jane Leverty, 87, of Longville, Minnesota, passed away on January 27, 2019, at St. Luke’s Hospital in Duluth. Betty was born in Woodland Township, Waverly, Minnesota on November 19, 1931 to Paul and Louise (Malok) Gabrelcik. Betty graduated from Roosevelt High School in St. Paul and lived in various locations including St. Paul, Rosemount, Lakeville and Longville. She married Robert Ahrens in 1953 and later married Francis Leverty on March 16, 1957 in Cerro Gordo County, Iowa. Betty worked for Great Northern Railroad as a key punch operator. She and Francis later moved to Longville to spend their retirement years. Francis passed away in August 21, 1997. Betty liked spending time reading books by Dean Koontz, Stephen King and James Patterson. She also liked walleye, listening to Big Band and 50’s music, and watching Court TV shows and TV Land. Her two cats Bink and Maggie brought her much enjoyment as did spending time with her children and grandchildren. Her dislikes included falling and breaking bones and electronics. Betty is survived by her children Patricia (Keith) Hutchinson, Michael (Anita), and Patrick (Linda); grandchildren David (Rebecca), Christina, Kolby, Jamie, Leyna and Grace; sister Janice (Guy) Hawkinson; nieces, family and friends. She was preceded in death by her husband Francis “Blackie/Frank”, parents Paul and Gertrude Gabrelcik and Leo & Louise Hausladen. Funeral Services will be at Salem Lutheran Church, Longville, on Friday, February 8, at 11:00am with visitation scheduled one hour prior to the service. Betty’s family will serve as pallbearers. Internment will be at Riverside Cemetery, Longville. In lieu of flowers, memorials are preferred. Cards may be mailed to the Leverty Family, 2155 State 200 NE, Boy River MN 56672. Arrangements are being handled by Dennis Funeral Home of Walker, Minnesota.